After a great inaugural event, the 2019 version of the Florida Coast 2 Coast relay is back for another ~205 mile point-to-point relay with male, female, and co-ed teams of 6 to 12 runners covering the distance, taking turns throughout the day and night. This event takes place along the Florida Coast to Coast trail which continues to develop from Titusville to Tarpon Springs. In addition to the improved course route, we’ve moved the event date earlier, to Friday and Saturday, April 5th and 6th, 2019, in an effort to find cooler weather, better suited for running. Space is limited, captains can reserve their spot today and add team members as they go. NOTE: racers should arrive 1 hour prior to their posted start times for a gear and safety check. CLICK HERE to view the 2019 Florida Coast 2 Coast Runner’s Handbook. CLICK HERE to view the running instructions for ALL stages of the 2019 Florida C2C Relay. There is a fast and flat 13.2 mile leg half way through the course. We will be awarding a special prize to the fastest runner through that section. Have an experienced half marathon runner on your team? This will be their chance to win the race within the race! Make sure you’ve selected the right teammate for this section of the course! Here’s a look at the 2019 Finisher Shirts. 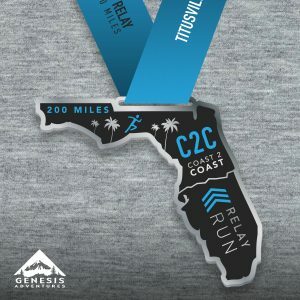 Registration for the 2019 Florida C2C Relay is open now! Team Captains, new for the 2019 is our team registration process, which will allow you to create a team, sign up your team members all in ONE TRANSACTION, and save money while doing it. Sign up 3-5 runners for your team in one transaction and receive 10% off at checkout. Sign up 6-8 runners for your team in one transaction and receive 12% off at checkout. Sign up 9-12 runners for your team in one transaction and receive 15% off at checkout. *Prices listed are per runner. Each runner is responsible for completing and paying for their own registration via Athlinks Registration. *Early Bird Pricing ends on 8/31/2018. *The 2019 Florida C2C Relay will be limited to 2000 competitors, so sign up now in order to guarantee your entry. *All entry fees are NON-REFUNDABLE. If the event is sold out, the entry fee is NON-REFUNDABLE and NON-TRANSFERABLE. E-mail info@genesisadventures.com for any inquiries involving transfers. Start Building Your Teams Now! Team captains that are not afraid of a little organization and a ton of motivation, we’re looking for you! Round up your friends, create your team, and stay on top of your teammates until they’re all signed up and ready to rock! If you’re a Type A runner that is always organized and always has a plan, now is the chance to show off your skills. Looking for additional team members? RSVP on our Facebook Event Page in order to meet new friends and future teammates! Team Captains are the get-it-done organizers of teams. They have a vision, they sell their running friends on joining them for the adventure, they keep up with race information, work on van rentals, check the supply lists and keep the team going. So, we have a crazy idea that all Captains should race for free! That’s right, if you’re on this newsletter, then our offer to you is a free entry for anyone bold enough to start a new team. Just send an email to info@genesisadventures.com with the Subject – Oh Captain! My Captain! and include a team name and we’ll set it up in our system and give you a code for a free Captain’s entry. STEP 1: In order to create a new team, the team captain must first choose which race category to run in, at the start of the registration process. STEP 2: Once you’ve selected the correct Race Category and entered your personal information, you will be asked if you’d like to “Create a New Team” or “Join an Existing Team”. Once you’ve selected “Create a New Team”, you will be asked to choose a team name. If your team is available, you’ll be able to continue forward with your registration. If you’re team name has already been chosen, you’ll need to enter a new team name. Don’t forget! Style points matter when it comes to best team names! Once your team Team Captain has completed his or her registration, you’ll be able to register and join that team. The first step is to select the correct Race Category as listed above. During the Registration process, you will be asked if you’d like to “Create a New Team” or “Join an Existing Team”. Select “Join an Existing Team” and enter the Team Name. You must know the correct spelling of the Team Name in order to correctly join that team. Relay teams are limited to 12 runners per team. Co-Ed Relay teams require 4 of each gender. Ultra Relay Teams are limited to 6 runners per team. Co-Ed Ultra Relay teams require 2 of each gender. You will not be able to add additional team members once you have completed your team. If you need to transfer an entry from one runner to another, please contact us via email at info@genesisadventures.com. In order to guarantee your team’s spot in the race, all team members MUST BE registered within 60 days of creating your team. If the event sells out prior to having all of your team members registered, we can not guarantee that your team will have a space. Get your teammates to sign up ASAP so they don’t miss out! If you would like to start a corporate team and pay for all athletes at one time, please email us at info@genesisadventures.com and we’ll assist you. Here are the updated 2019 Running Directions for this year’s Florida Coast 2 Coast Relay. This is a guide to the course that breaks down the route. Best utilized by teams to plan and strategize and assign runner’s to legs. Happy Planning! Please click for a link to the 2019 FLC2CparticipantWaiver. 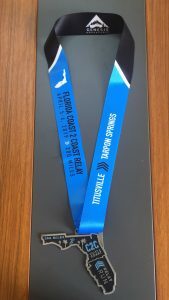 Sneak Peak at the 2019 Medals! Last year (2018) was unusual. Due to the hurricane and aftermath, there were still some portions of the Coast to Coast Trail System that were unusable. Therefore, in order to get the full 205 miles in, we made the decision to double up on some of the legs in order to get the full 200 miles into the event. The trails have since been repaired and this year (2019) we have a full course! So, there is no requirement to double up on legs. Teammates WILL still BE ALLOWED to accompany runners on bikes during night segments for safety purposes, as well as to ensure runners are aware of course markings and upcoming changes in course route. 2019 Florida Coast 2 Coast Course Map! 2019 Course Legs and Distances Updated! CLICK HERE to view the running instructions for ALL stages of the 2019 Florida C2C Relay. There were a number of adjustments made from the 2018 route based on runner and staff feedback on the 2018 event. Here are some quick adjustments we’re making based for next year’s event. Course Gap 1 should be complete by February, so the first half of the course will be continuous. All required double (two runners at the same time) legs will be at night to reduce or eliminate the number of legs runners will complete solo at night. Teammates WILL BE ALLOWED to accompany runners on bikes during night segments for safety purposes, as well as to ensure runners are aware of course markings and upcoming changes in course route. Sponsors – We already have two sponsors for 2019 we’ll announce shortly. A Beginner’s Guide – if you have any advice you’d like us to include for newbies, please send it along to info@genesisadventures.com. New Gym Category – we’re starting outreach to every gym in Florida (Crossfits, Orange Theory, etc.) Create your team under the name of your gym in order to be entered into this category. New 6-pack category to match smaller teams with another van. Create a team of 6, and we’ll match you up with another group of 6 with a similar pace per mile to complete your team. Themed Transition Areas – Coffee, candy, glow necklaces, we’re going to amp up the TA experience in 2019! Runners, if you’re having a trouble filling your team, or are just looking to join an already existing team, our new Team Finder Service is here to make your life easier. Simply email us with how many people you have, and we’ll match you with others to round out your team. Send emails to info@genesisadventures.com and one of our reps will get you set up. One less excuse to get signed up! Stay tuned to the Updates section this event page for more news as it’s released. There is a fast and flat 12+ mile leg approximately half way through the course. We will be awarding a special prize to the fastest runner through that section. Have an experienced half marathon runner on your team? This will be their chance to win the race within the race! Make sure you’ve selected the right teammate for this section of the course! Keep an eye on the Updates Tab for more information to be released soon! For your reference, below is a copy of the 2019 Runner Handbook. For 2019, we have released info including modifications to running legs, rules and regulations. Each team is allowed to have TWO passenger vans in order to shuttle teammates from checkpoint to checkpoint. Each checkpoint will have different parking requirements. Runners will be on bike paths, bike lanes, and sidewalks as necessary. While running at night, racers are required to wear a reflective vest, a LED headlamp, as well as flashing LED lights. Runners will cross all intersections as pedestrians. No road closures expected. During night sections, teammates WILL BE ALLOWED to accompany runners on bikes. This added safety element will ensure runners feel comfortable running at night, while also allowing bike riders to view course markings in advance of teammates to make sure everyone follows the route correctly. There will be a number of checkpoints along the route. Exact locations of checkpoints to be finalized once course route is approved. 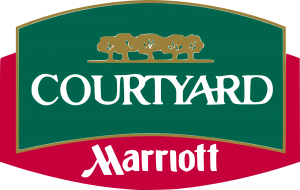 We are happy to announce the hotel offering our runners a special group rate: Courtyard Tampa Oldsmar for $129 USD per night.